This fresh and flavoursome dish works well as part of a dinner spread or on its own. Note: Serve with pork belly and kimchi stir fry, steamed rice and steamed Asian greens drizzled with oyster sauce. 1. Whisk dressing ingredients together in a bowl until the sugar has completely dissolved. 2. 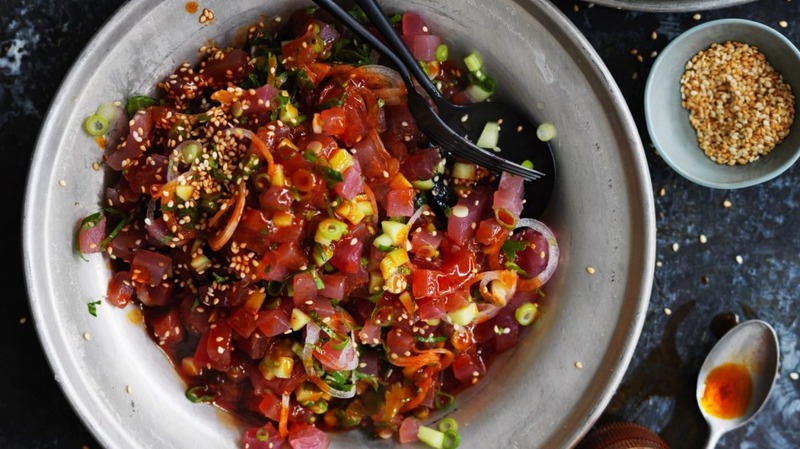 In a medium bowl, gently toss tuna, cucumber, spring onions, shallots, coriander and season with salt to taste. 3. Place lettuce on 4 plates and divide the tuna mix among them, making a mound on each bed of lettuce. (Alternatively, allow everyone to make their own parcels, san choi bao style.) Sprinkle with the sesame seeds.